Nearly half of employers who must set up a pension scheme for their staff in the next two years are confused about their responsibilities, a survey says. More than a million small businesses will need to enrol employees automatically into a workplace pension scheme. The survey by the Federation of Small Businesses (FSB) found that 45% of those asked were unclear on the rules. But the Pensions Regulator hit back, saying auto enrolment was a success. The deadlines for conforming to the rules pick up rapidly this month. Some 25% of those surveyed by the FSB also feared that their business might not be able to cope with the extra cost. Since 2012, 5.4 million workers have been signed up to a workplace pension under the auto-enrolment programme. All employers are being warned that they need to offer pensions to anyone who is over the age of 22 and who earns more than £10,000 a year. That includes, for example, nannies, care workers, plumbers and bar staff. Bosses will be given a deadline to comply with the rules. 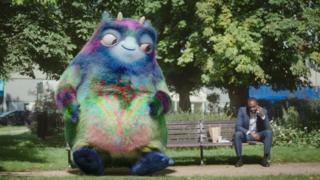 A major advertising campaign by the government, featuring Workie - a 10ft hairy monster - is being run, aimed at ensuring small businesses pay attention to the new rules. The FSB said that such a campaign was vital, as awareness of the rules had been so low. The federation also welcomed improved information on the website of the Pensions Regulator. "Our message for small employers is auto enrolment is coming and will affect your business - and the sooner you get to grips with what you need to do, the better off you will be," said John Allan, FSB national chairman. Lesley Titcomb, the chief executive of the Pensions Regulator, said that so far auto enrolment had been a great success, with over 70,000 employers signing up to it. "We're not complacent," she told the BBC. "In the next three months, 100,000 employers have got to enrol their employees. The message to them is that they need to start early, and make a plan." The FSB also said that employees should pay attention to their rights, and ensure they are being given the appropriate pension provision and contributions.